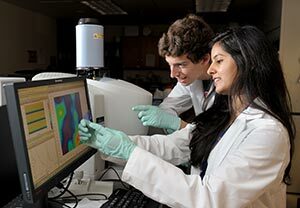 For the second year in a row, the “Discoveries in Bioimaging” Research Experiences for Undergraduates (REU) program, funded by the National Science Foundation (NSF), has brought 10 undergraduates from universities across the United States and Puerto Rico to the University of Illinois to learn about research. Led by Stephen Boppart, professor of electrical and computer engineering and the co-chair of Beckman’s Integrative Imaging theme, and Andrew Smith, professor of bioengineering, the Illinois program focuses on bioimaging. Leading researchers from a number of labs across campus discussed their work during an initial week-long bootcamp. Under the guidance of graduate student mentors, the undergrads have been working on diverse projects. Kavanaugh has been working in a lab that focuses on genetically modified proteins and peptides, where he focuses on their surface characterization on metals via atomic force microscopy. At Illinois he’s been working in the lab of Rohit Bhargava, professor of bioengineering and member of Beckman’s Bioimaging Science and Technology Group. Their project is building a classification system for cancerous tissue samples that have been taken by infrared spectroscopy. With the help of his mentor, graduate student Saumya Tiwari, he’s been writing a computer program that can help in the analysis of the samples. Jorge Maldonado is about to begin his senior year at Universidad del Este in Puerto Rico. 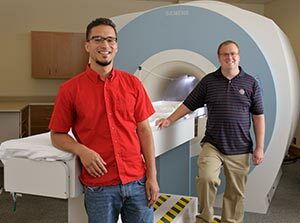 He’s working with Brad Sutton, associate professor of bioengineering and member of Beckman’s Bioimaging Science and Technology Group, on a project focusing on patients with multiple sclerosis using the magnetic resonance imaging (MRI) machines at Beckman’s Biomedical Imaging Center. Maldonado appreciates the resources that the Beckman Institute has. Hannah Bouvin is going into her junior year at Iowa State, where she’s studying chemical engineering. Her project at the Beckman Institute is directed by Wawrzyniec Dobrucki, assistant professor of bioengineering and member of Beckman’s Bioimaging Science and Technology Group. Her mentor is Jamila Hedhli, a graduate research assistant. Their project is looking at the effect of adipose-derived stem cells on angiogenesis. For both Kavanaugh and Maldonado, the thrill of research lies in what results. Illinois’ reputation as a leader in bioimaging provides inspiration to the students and encourages them to consider graduate school in the field, said Marina Marjanovic, associate director of the Center for Optical Molecular Imaging and coordinator of the program. 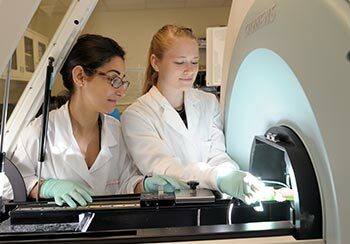 “Our REU Discoveries in Bioimaging program is dedicated to inspiring and training undergraduates in STEM fields through a summer experience in bioimaging research,” said Marjanovic. “The unifying link between bioscience, discovery, and bioimaging is an inspirational centerpiece for this site at the University of Illinois. The experience may also lead some students to study further, perhaps at Illinois.